Ask people what they love most about summer and you’ll get all sorts of answers. For some, it might be the anticipation of going away on vacation, while others just want to spend more time at the beach. But for some people, it’s all about the adventure and discovering new things to do. If this is you, you’re in luck. Downtown San Diego has plenty of fun stuff happening this summer that you won’t want to miss. 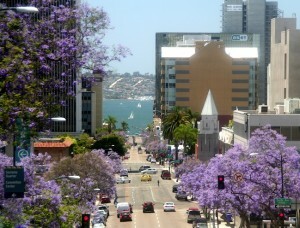 Right now, the streets of San Diego are filled with beautiful Jacaranda trees, all exploding with bright, purple colors. You can enjoy them along Ash Street in Downtown, where a large group of Jacaranda trees line both sides of the thoroughfare. In Balboa Park, Jacarandas planted many moons ago by Kate Sessions added charm to the San Diego scene. Send us a photo of these trees somewhere other than Ash Street. The most creative picture will win 2 tickets to the Zoo, 2 tickets to a public Scavenger Hunt (held most Saturdays) and 2 tickets to a Coronado Biking Adventure, held Fridays and Sundays at 10:30 a.m. Be sure to strike a creative pose with you and a friend in the background. Email photos to tours@wheretours.com by June 29. Marc & Darlynne Menkin are the co-owners of “Where You Want To Be Tours.” Many of their tours and team-building scavenger hunts feature secret Downtown areas. They can be reached at menkin@wheretours.com.